Set to be the star of your bar area, the Sole Wooden Stool Antique Cream combines vintage charm with chic modern design. A fine choice for rustic spaces and a funky addition to contemporary bars, the Sole Wooden Stool is a fantastic piece for your home. 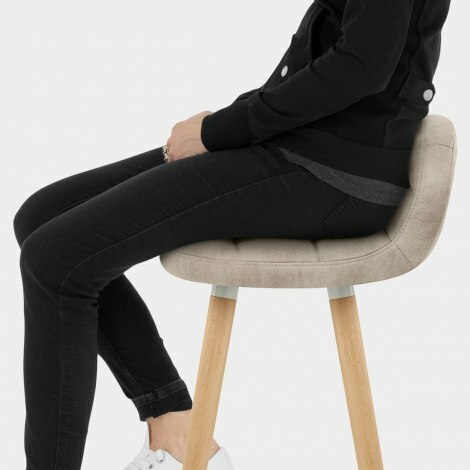 Covered in antiqued cream faux leather, the padded seat and low lip backrest offer comfort and support whilst seated. 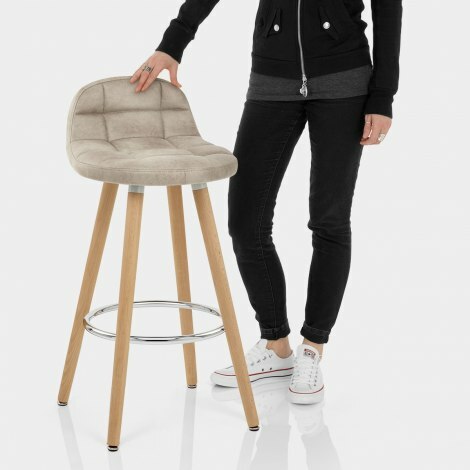 A stylish grid stitch detail adorns the seat and adds to the stools unique allure. The four solid wooden legs slope outwards to form a pyramid style shape, whilst the oak finish brings a natural quality. Plus, a circular chrome footrest looks after your feet and adds a contemporary touch to the wooden frame. Each leg is finished with an adjustable protective plug, for use on uneven floors, ensuring the Sole can bring its original style to a host of settings. "Great service, price, quality is superb and very sturdy"
Great service, price, quality is superb and very sturdy. Was looking for stools for my new kitchen for a few weeks. Came across this website by chance. Best thing ever. Had a good choice but because these had fixed legs suited me better. Good picture and size on website. So very pleased. Style and quality all good. Didn't take hubby long to put together. Very very pleased.